An insulated jacket is an essential piece of kit for anyone heading for the hills during winter. Temperatures can drop markedly as you ascend, and add in a windchill and you’ll soon be feeling uncomfortable or even worse, heading for hypothermia if you’re not properly equipped. When you’re working hard uphill, the exertion will probably keep your temperature up, but if you need to stop for that meal break or to belay or just to admire the view, you’ll soon appreciate the warmth of an insulated top. When we last tested insulated jackets three years ago, the choice was fairly simple: down or synthetic. The former offers greatest warmth for its weight, it packs down into a small space but it’s expensive and doesn’t work well when it’s wet or damp and the lofting that provides the air spaces that insulate collapse. Plus, there are ethical questions over some of the down in use. Synthetic insulation, usually a form of very thin polyester filaments that mimic the properties of down in trapping air, is cheaper, works almost as well when damp, and is cheaper. But it’s harder to compress and usually heavier. Designers and manufacturers have been busy in the meantime trying to maximise the advantages and mitigate the disadvantages of the two basic fillings, and the choice is no longer binary. In our test are jackets that use improved hydrophobic treatments on the down to help shed water and aid the retention of loft. Almost all the down is ethically sourced, and the insulation is still the lightest for a given warmth. Synthetic insulation manufacturers have also been hard at work developing new materials and many of the jackets using a form of polyester filling have improved packability and reduced weight. And then there are those that use a mixture of synthetic and down, combining the excellent heat retention of down with the ability of polyester filaments to retain their lofting structure when wet and thereby supporting the general insulation of the garment. So, while it’s still true to say down is warmest, lightest and most packable, the choice is more complex and the new materials are advancing fast. We’ve scored the jackets primarily on warmth and packability – winter rucksacks are likely to be filled with extra gear compared to a summer daysack, so the less space taken up by your jacket the better. But not all outdoor users will be after maximum warmth, and some of the jackets are aimed at those who need a modicum of insulation but good breathability when working hard, for instance running, climbing or skiing uphill. So don’t dismiss a jacket with a lower warmth rating if these are your main activities in winter. Some of the jackets are unisex, others come in both men’s and women’s versions. Where this is the case, we tested the men’s model. The Nunat is part of Berghaus’s high-performance Extrem range, and uses Hydrodown powered by Nikwax for its insulation. The down carries the Responsible Down Standard label for its ethical sourcing. Further green credentials come from the lack of perfluorinated chemicals in the down. Berghaus says the latest incarnation of its Hydrodown provides water repellency for up to 16 hours. The shell is Pertex Quantum fabric, a 16 denier polyamide face material designed for windproofing and breathability. 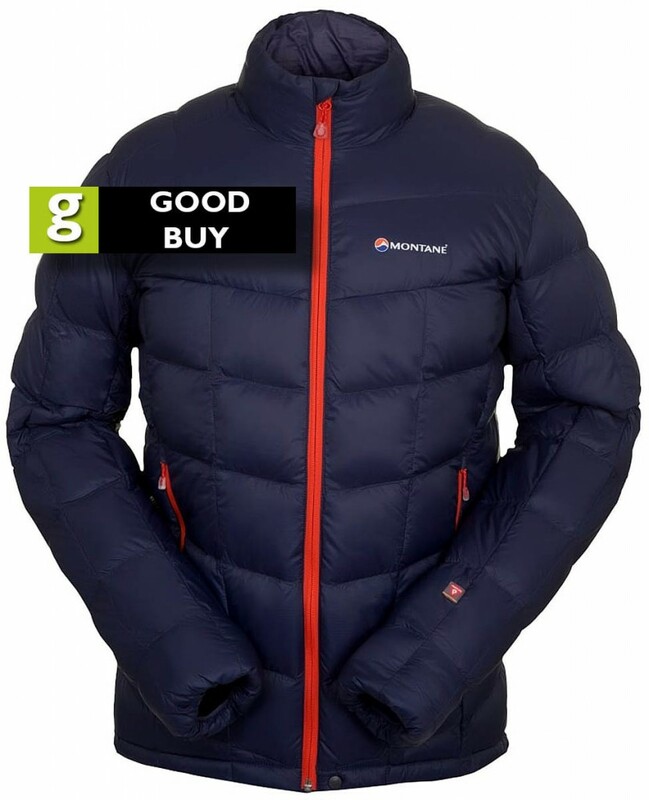 The jacket also has an aluminium mesh sewn into the jacket’s insulation core that Berghaus says gives up to 10 per cent better thermal efficiency. The insulation is also body mapped to provide maximum insulation in those areas where it’s needed. The Nunat Reflect has a full-length double-puller zip, backed by a baffle to keep out draughts. There are two zipped handwarmer pockets, through which the jacket’s hem can be cinched in via the shockcord which the pockets contain. There’s an inside zipped pocket too, easily big enough to accommodate a modern smartphone. The sleeve cuffs are lightly elasticated and the Berghaus jacket has a full hood with an elasticated edge. There is also a single ‘halo’ volume adjuster at the rear to cinch the hood. Although the adjuster works well at keeping the hood in place, because there is no front adjustment, the hood was not particularly snug against the face, and allowed wind to creep in the sides in a headwind. The soft chin protector did improve comfort. The hood is fairly snug and best worn underneath a helmet if you’re using one. The handwarmer pockets can be used while wearing a climbing harness. Breathability for such a warm jacket was quite good. The Extrem Nunat Reflect is a beefy-looking jacket with good amounts of insulation, at home in the winter mountains and provided the greatest warmth of any jacket in the test. The Keb Padded Hoodie uses G-Loft Supreme synthetic insulation, 10 per cent of which comes from recycled polyester. It makers say this element actually helps the performance, adding to the structure and lofting properties. The synthetic insulation also continues to work well when wet, Fjӓllrӓven says. The Fjӓllrӓven jacket is one of the less bulky ones in the test and its Scandinavian styling doesn’t scream ‘mountain’, so it’s quite at home on the street as well as the hill. The quilted sections are quite large, with the two main sections at the top of the jacket covering the chest, and three lower ones in the abdomen area. The back and sides have more conventional, evenly spaced sections. The jacket has a full-length, double-puller zip, and there are two unzipped handwarmer pockets. There is a good sized zipped external chest pocket, and one similarly sized internal mesh pocket. The hem doesn’t have any adjustment. The sleeve cuffs have light elastication. The hood has a single volume adjuster at the back for the halo-type drawcord and this worked well in a headwind, keeping the hood snug against the face. There is also a soft peak on the hood. The hood will just about accommodate a standard helmet but wearing the hood underneath a helmet is a better bet. A climbing harness restricts access to the handwarmer pockets. Breathability was good and for a low-bulk jacket the Keb Padded Hoodie was reasonably warm, though suited to cool days rather than the coldest winter excursions. Windblocking was good. We liked the Scandinavian styling of the Keb and its quality was good. A nice jacket for general use in winter and cool days on the hill. This is an unusual inclusion in our tests, because it’s what’s called a ‘seed garment’ produced by Gore to demonstrate the company’s new Thermium material. The jacket is not one that is on sale to the public, but Gore Thermium will be appearing in insulated garments from this season, with brands such as Arc’teryx, Mountain Equipment, Black Diamond and Salewa producing jackets using the new fabric. We’ve been using the Gore jacket over an extended period. It has a water-resistant shell, designed to keep the insulation dry in light rain or snow showers, while still allowing good breathability. It bridges the gap between full-on waterproof hardshells and windproof garments. We first used the jacket, which has synthetic, polyester insulation in this case, on a hard hill walk in cold conditions with snow showers. It performed impressively. The seed jacket is well equipped, with a double-puller zip backed by a baffle. It also had a snow skirt. 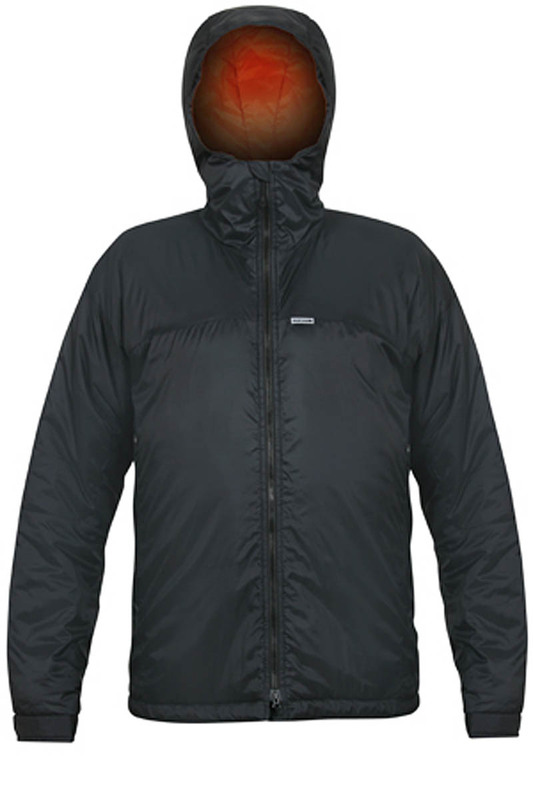 The jacket has pit zips with mesh linings, a hood with a stiffened peak and single halo drawcord plus concealed spring toggle adjustments, Velcro fastening sleeve cuffs with stretchy handwarmer linings with thumb loops, two zipped handwarmer pockets, a zipped external bellow chest pocket, zipped internal pocket, along with an open internal mesh pocket, and a thin neck baffle. In fact, pretty much all you could ask for in a jacket. The insulation was quite thick and the jacket was warm. We spent a lot of time fairly stationary on a hilltop on the first test, but the jacket kept us warm. This was after a cross-country hike off paths to reach the summit, which produced a fair amount of sweat, but this did not impede the insulating properties of the jacket and soon dissipated. A climbing harness restricts access to the handwarmer pockets, but the hood will accommodate a helmet. The hood worked well and turned with the head. Windblocking was very good, and the jacket was ideal in changeable, cold, windy conditions. We’ve since tested it in varying situations and the jacket has always felt comfortably warm. In showery conditions it performed very well. The fabric felt robust but was fairly soft and quiet. The membranes worked well in keeping out snow and wind and letting moisture escape. Because of the nature of the seed jacket, our results aren’t directly comparable with other jackets in the test. There’s no retail price so we’ve given it a middling value score, and the jacket may or may not include features that brands could include that would have an influence on its performance. But Gore Thermium is an interesting addition to the outdoor range and worked well on our tests. The first thing you notice about the Essens III is its very light weight. 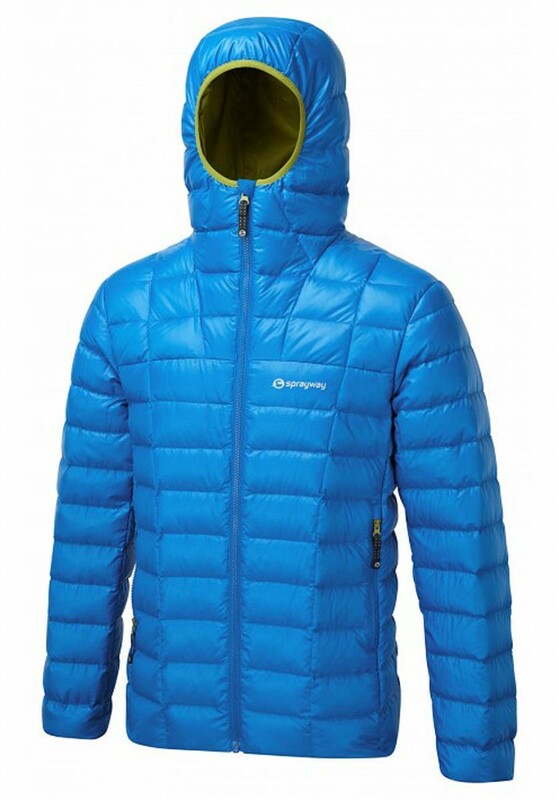 The use of high-quality, 800 fill-power down produces not only a very light jacket, but a compressible one too. It’s possible to scrunch the Haglöfs up into one of its pockets for storage in your pack, though as always, closing the zip when it’s inside-out isn’t easy. The down is treated with a fluorocarbon-free durable water-resistant solution, as is the Pertex Quantum polyamide face fabric, to help repel moisture. The down is sourced to the Responsible Down Standard and the whole garment is bluesign approved. The baffles of the insulation are horizontal, getting progressively narrower towards the bottom of the jacket. The main zip has a single puller and is backed by a baffle to keep the wind out. There are two zipped handwarmer pockets and a good sized external zipped chest pocket. The sleeves have elasticated cuffs and at the shoulder and armpit area there is a section of Polartec Powerstretch, which helps mobility, especially when reaching up for holds on the hill. The jacket hem is elasticated. The jacket has no hood, though a hooded version is available, which adds about 50g to the weight and £20 to the price. The collar fits fairly snugly round the neck when the garment is fully zipped up. The handwarmer pockets could be used, just, when wearing a harness. The Essens III was quite warm, despite the light weight and good packability, with the 800 fill-power down providing good insulation. Quality of the jacket was good. The big plus for the Haglöfs jacket is its very light weight and the fact it packs down smaller than any other in the test, while still providing good warmth. The Keela jacket varies from others in the test by having a half-zip pullover smock design. It uses PrimaLoft’s Gold Insulation, with a shell in Flylite Ripstop nylon fabric. The ripstop pattern is very subtle, but the outer face feels robust while keeping its softness. The fabric has some water resistance too. Keela says the Belay Hooded Smock was originally developed for tactical forces, and one of the colour options is Army green. The Belay continues Keela’s ethos of offering fully featured clothing at competitive prices. It has a detachable hood, held by four press-studs, and is adjustable via two front drawcords with spring toggles and by a rear volume adjuster that has a double d-ring set-up with fabric strap. It’s not the easiest of systems to adjust while wearing gloves, but it does hold when cinched. The hood also has a small wired peak. It turned reasonably well when cinched in, and accommodated a helmet. There’s a soft neck baffle which becomes the collar when the hood is detached. This has a separate single drawcord and spring toggle to cinch in to keep the wind and weather out. The hood worked well in a headwind and was comfortable. The smock has a fairly beefy feel to it, and it’s certainly no lightweight. The insulation does loft well and provides good warmth, and the Belay Smock has a nice soft feel which adds to the comfort. 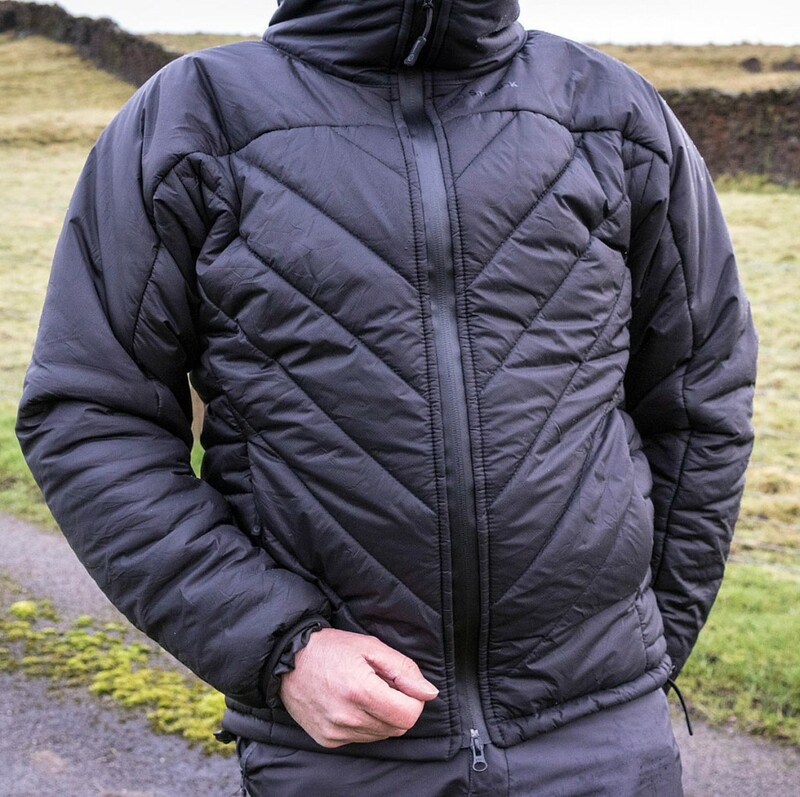 The Keela jacket has double zipped handwarmer pockets in a kangaroo arrangement, the inner edge of which is lined in warm microfleece-type fabric. There is also a large zipped chest pocket which is deep and wide enough to swallow a laminated OS map with plenty of space to spare. The chest pocket also has a reflective strip on its storm flap. Access to the handwarmer pockets was restricted when wearing a harness. The sleeve cuffs have Velcro adjustment flaps and the smock’s hem also has two Velcro tabs to tighten it to keep out updraughts. Venting is available for the smock via two long zips that run all the way from its bottom hem to the armpit, enabling a great deal of air to be allowed in when working hard uphill. The zips have double pullers so can be opened either from the bottom or the top. The venting worked very well while pushing the pace on uphill sections and certainly aided the general ability of the Belay smock to shift the moisture outwards. All of these features are in a garment that will hit your wallet less than any other in the test, so the Keela Belay Hooded Smock certainly scores on value. 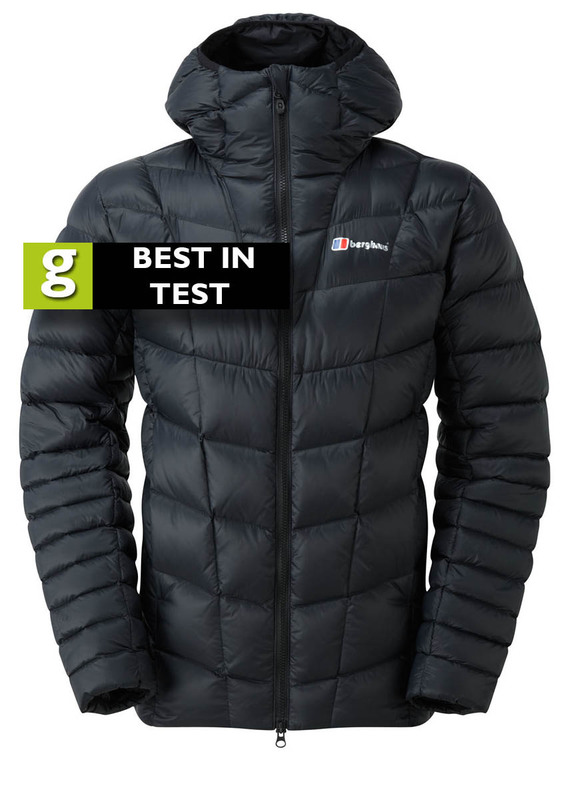 This Mammut jacket is an addition to the test, arriving a little later than the other brands in the review. It was tested in similar conditions to the other samples. The Rime Pro IN uses PrimaLoft silver insulation, with thicker 100g/sq m in the torso and upper arm area, and slightly less bulky 80g/sq m material in the sides and under-arm parts of the garment. The outer shell of the jacket also uses two different materials. In the shoulders, upper arms and hood, a robust-feeling Pertex Endurance provides good water resistance and windproofing; Pertex Microlight is used on the rear of the jacket and under the arms, where such properties are deemed less important, but weight-saving is. 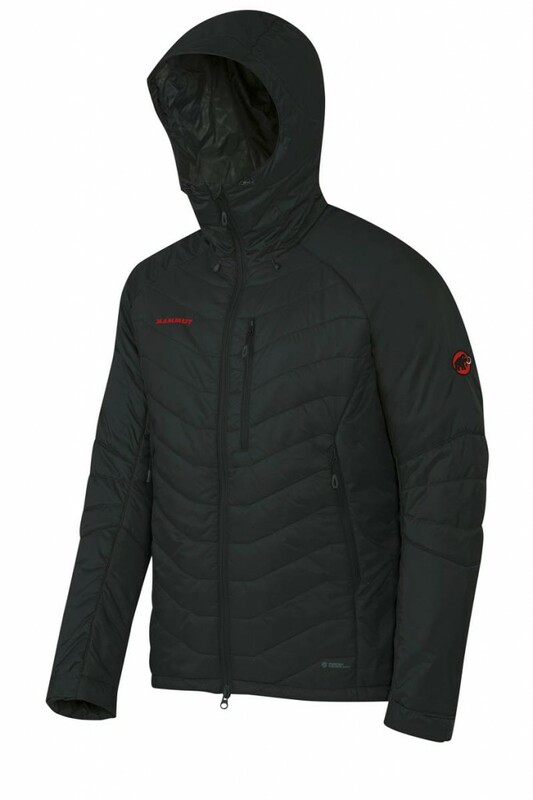 The Mammut jacket has a good quality feel, and has a double-puller main zip, backed by a baffle to help keep out wind. There are three external pockets: two zipped handwarmer pockets with soft tricot lining, and a smaller zipped chest pocket, big enough for items such as smartphones. Inside the jacket are two sizable stretch mesh pockets, which accommodated laminated OS maps and are also useful for stashing items such as gloves or hat. The sleeves are articulated and have Velcro adjustment at the cuffs. 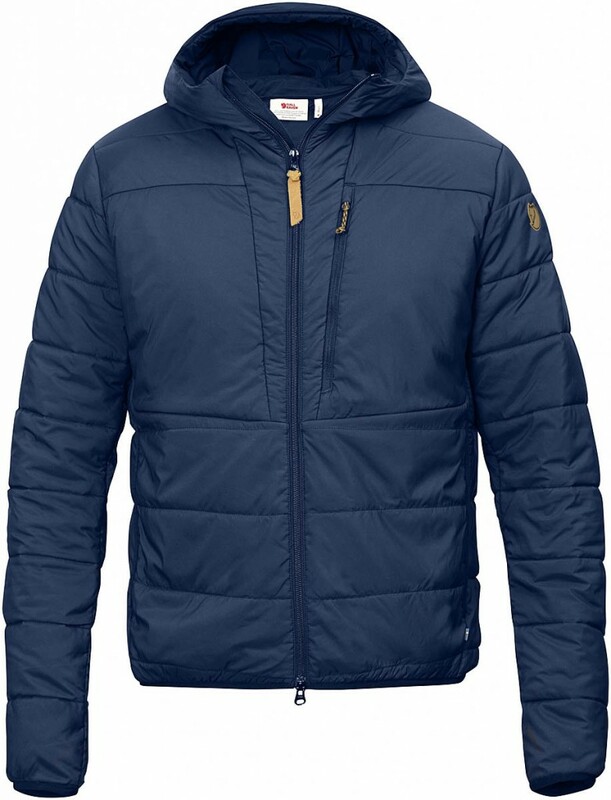 The insulation is quilted on the upper side of the arms and in the front and back of the jacket, while the slightly thinner PrimaLoft sections in the sides and underarms are plain, with no baffles. This ‘body-mapped’ layout is designed to aid breathability and the jacket did well in this respect, with moisture transfer working well when worn on uphill sections of our test routes. The hood of the Rime Pro IN is well designed and worked well. It has a rear ‘halo’ volume adjuster plus two front drawcord adjusters. This enables the hood to turn well with the head and it was stable in a headwind. It also has a semi-rigid peak. Visibility was good when it was cinched. The hood accommodated a standard climbing helmet well and the handwarmer pockets were usable while wearing a climbing harness. The Mammut jacket has a large tricot chinguard area and the main zip parks nicely in its cowl which made the garment comfortable when fully zipped in a headwind. Packability was fairly good, but the jacket wouldn’t squeeze into as small a stuffsack as the best down garments. Overall warmth was good, especially as the Rime Pro IN isn’t a particularly bulky jacket. 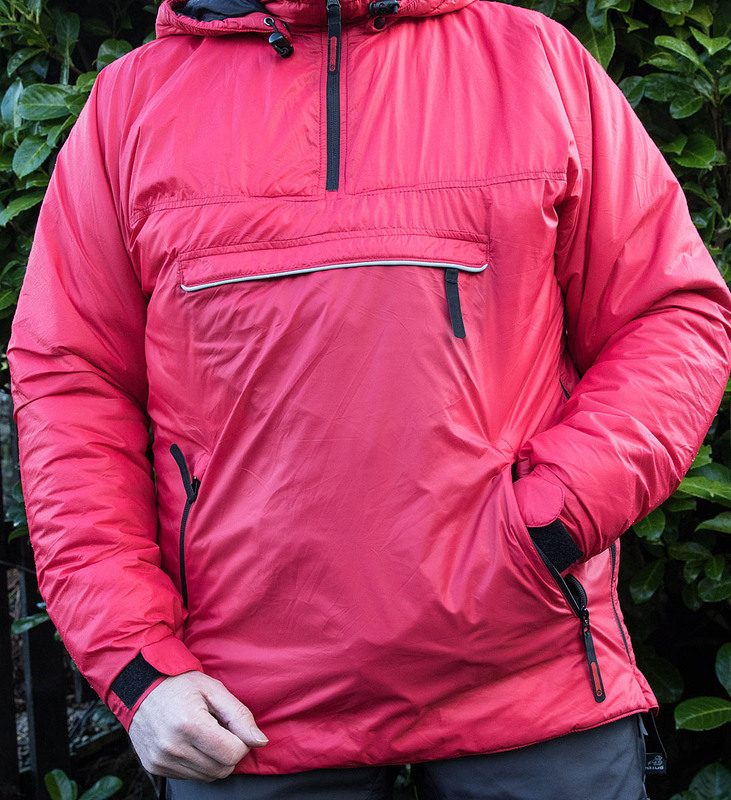 Sizing was very snug, with the Mammut jacket coming in a good size smaller than comparable jackets in the test, so we recommend trying one on for size before you buy, so you get the correct size. This is important too if you want to use the jacket over your shell waterproof, a useful feature of the design, which means you don’t have to strip down on the hill when you need extra warmth in the wet. We like the style and quality of the Mammut jacket, which has good design features throughout. It’s another example of how synthetic garments are closing the gap for warmth and weight on traditional down jackets. The Rime Pro IN Hooded Jacket is a versatile top, whether you’re belaying a climb, heading on a hill walk or just need a bit of warmth on the street when the temperature drops. Montane’s jacket uses PrimaLoft Silver Insulation Down Blend, which combines water-resistant down with PrimaLoft synthetic polyester filaments to produce a garment that keeps its loft even when it gets damp. This is clearly good news for UK walkers who are more likely to encounter wet conditions than sparkling Alpine dry days when the temperature drops below zero. 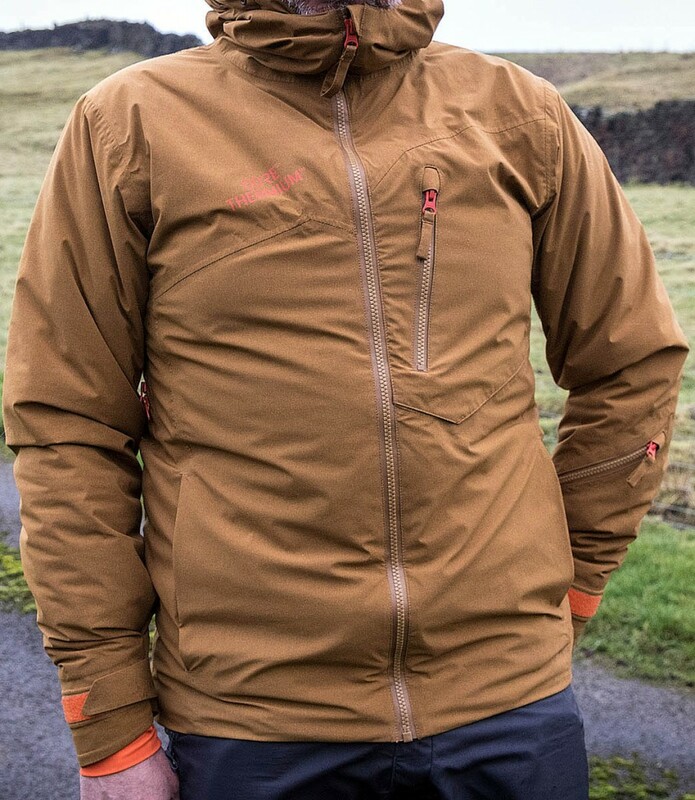 The Montane jacket is part of a developing trend for outdoor brands to offer insulated clothing that doesn’t need to be protected from the damp as used to be the case with conventional down filling. There’s a price advantage too, in that using less of the more expensive natural filling means the cost can be pinned at a lower level. The label on the jacket actually said it had a 70-30 per cent mix, but Montane’s specs quote a 60-40 per cent combination. The down in the mix is 90-10 down-feather mix, to Responsible Down Standard, with Track My Down traceability. The Blue Ice’s shell fabric, Barrier Lite RS, a ripstop nylon with durable water-resistant treatment, which will shed a few shower drops. Weight is good, too, at less than 500g. The jacket has a full-length, single puller zip with reversed coil, backed by a baffle, which kept out the wind. The quilting baffles are fairly well spaced, which helps the insulation loft. The jacket doesn’t have a hood, but the soft collar has a chin guard to help increase comfort. There’s no neck adjustment, but the collar did fit snugly. The jacket’s hem has twin drawcord and spring-toggle adjusters to cinch it in to keep out updraughts. The sleeve cuffs have elastication, set back a couple of centimetres from the ends. There are two zipped handwarmer pockets, and there is also an internal zipped chest pocket, large enough for an oversized smartphone. Breathability of the jacket was fairly good. The two pockets were accessible when wearing a harness. The Montane Blue Ice also comes with a good, roll-top, waterproof stuff sack. We liked the Blue Ice’s performance both when dry and in the damp, but the fact it has no hood might be a significant factor for some users. Most people will be accustomed to trying to keep an insulating jacket dry, but this Páramo garment is designed to be put on over one of the brand’s waterproof jackets rather than underneath it. The Torres uses Analogy Insulator synthetic material to provide warmth. The design means you don’t have to take off your waterproof jacket when the temperature drops or you’re stationary – never a pleasant prospect. You simply put on the Torres over the waterproof to provide the insulation. Páramo says the Torres Alturo is ideal for high mountain activities which involve sustained low temperatures. The jacket has a full-length double-puller zip backed by a baffle to keep out the wind. The feel of the jacket is very soft and there are no external baffle quilting stitchings visible. The insulation lofts well. The jacket’s hem has double drawcords and spring toggles to keep out the wind and any spindrift, and the sleeves have Velcro adjustment at the cuffs. The hood has a wired peak and also two front drawcords with spring toggles, plus a rear volume adjuster with a buried spring toggle that was a little fiddly to use, especially when wearing gloves. The rear adjuster on the hood had limited travel, so in a strong headwind we needed to cinch in the front cords quite a bit to keep out the wind, which limited vision a little. It will accommodate a helmet, however, and in fact works better while using one, with the hood turning with the head. The Torres Alturo has two zipped handwarmer pockets plus a good sized internal zipped pocket, all of which were big enough to take a laminated OS map. The jacket can also be stuffed into its internal pocket, though it did fight back a little. Care needs to be taken not to strain the zip when stuffing and unstuffing. There is a hanging loop for the packed jacket when it’s inside its pocket. When wearing a climbing harness, the handwarmer pockets were still usable. The weight of the Páramo jacket was middling and breathability was good. There’s certainly a lot to be said for not having to take off your waterproof layer when you need some extra warmth. On a filthy Peak District Day with lying snow but drizzle and general murk prevailing, it was simply a case of getting the Torres Alturo out of the pack when needed and slipping it over the waterproof shell, which was much appreciated. The redesigned Rab jacket is aimed at fast-moving outdoor users, and features PrimaLoft’s Gold Active Insulation, a synthetic filling that is said to offer top breathability. The insulation retains much of its warmth when damp, so this is another jacket that works well in Britain’s climate. There’s no quilting on the jacket, which gives it a sleek appearance and also eliminates the cold spots that can occur at stitched points. The PrimaLoft Gold Active is clearly constructed to maintain its integrity without the need for quilting. 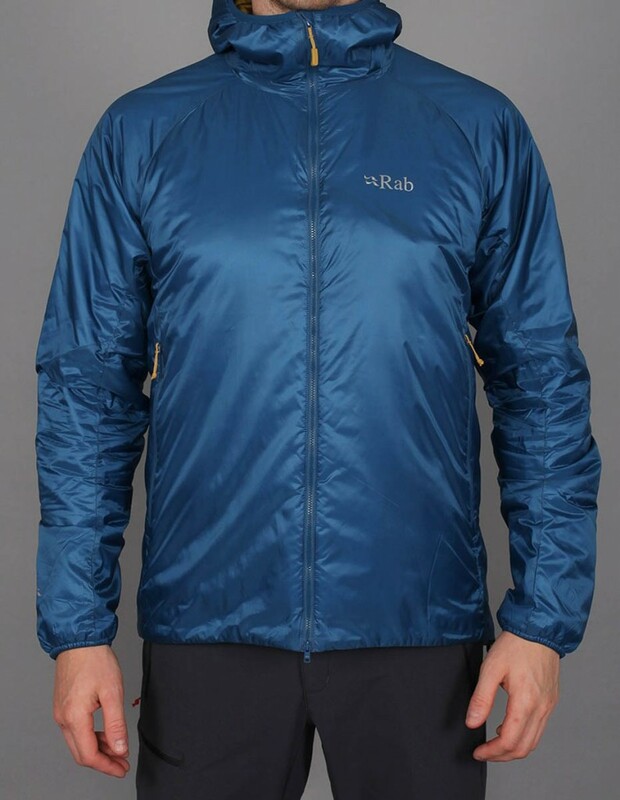 Face fabric of the jacket is nylon Pertex Quantum ripstop which gives the Rab jacket a soft, comfortable feel. Fit is slim and the Xenon-X hugs the body well. The double-puller main zip is backed by a baffle and there’s a small chin guard area at the top. The hem has twin drawcords with spring toggles to cinch it in. The hood is a simple design with no adjustment, but it does have elasticated binding. It’s designed to be used under a helmet, rather than over the top of one, though both are possible. The hood doesn’t turn with the head, but it did stay in place in a headwind. It turned better while wearing a helmet, however. The sleeve cuffs also have elasticated edging. There are two zipped handwarmer pockets, and a zipped internal one for a smartphone or GPS unit. The inside pocket can also be used as a built-in stuffsack. It helpfully has pullers on both sides of the zip so it can be opened and closed easily when used a sack. The handwarmer pockets were easily accessible when wearing a harness. The Rab Xenon-X is very much a pared-down, minimalist jacket aimed at users who want to keep warm but also keep the weight to a minimum. It’s the second-lightest in the test, which is impressive for one using synthetic insulation. The Nangpala is another jacket that uses PrimaLoft’s Silver blend of goose down and polyester, which is claimed to retain 95 per cent of its warmth when it gets wet. The shell of the garment is made from 100 per cent recycled polyester and has durable water-repellent treatment to shed a shower or two. The quilting is in narrow horizontal baffles and it doesn’t feel to loft as fully as some others in the test, but it packs down well, into a supplied stuffsack with drawcord closure. The jacket’s main zip has a single puller and a draughtproofing baffle behind it. There’s a soft chin guard at the top. The hood is roomy and has two front drawcord adjusters with spring toggles and tethering loops for any excess cord inside the jacket. There is no rear volume adjuster, however. Because the hood has quite a large volume, adjusting it using only the front drawcords enough to keep it up in a headwind means vision is restricted. It easily accommodated a helmet and, while wearing one, turned better with the head. The sleeve cuffs are lightly elasticated and the Sherpa jacket’s hem has twin drawcords with spring toggles to cinch it in to keep out the breeze or any spindrift. There are two zipped handwarmer pockets lined with soft, warm material, and there is also a zipped external chest pocket, with a cord exit for headphones. Inside the Nangpala are two unzipped pockets, both large enough to take a laminated OS map. It was just possible to use the handwarmer pockets while wearing a harness, but access was a little impeded. Breathability of the Sherpa jacket was good. There are the usual nice Sherpa Adventure Gear touches, with Nepalese designs in pocket binding and on the zip puller. If looks are important, the Nangpala was one of the nicer looking designs in the test. The SJ6 is the middle model in a range of insulated jackets produced by sleeping bag experts Snugpak. The jacket is the only one in the test manufactured in the UK – the SJ6 is produced in the company’s West Yorkshire factory. The SJ range was updated in 2015 to give it a more ‘outdoorsy’ look and provide a more fitted, body-hugging fit. The SJ6 is rated, sleeping-bag style, to provide comfort down to -5C and uses Snugpak’s own Softie Premier polyester insulation, developed with Swiss company Härdi. 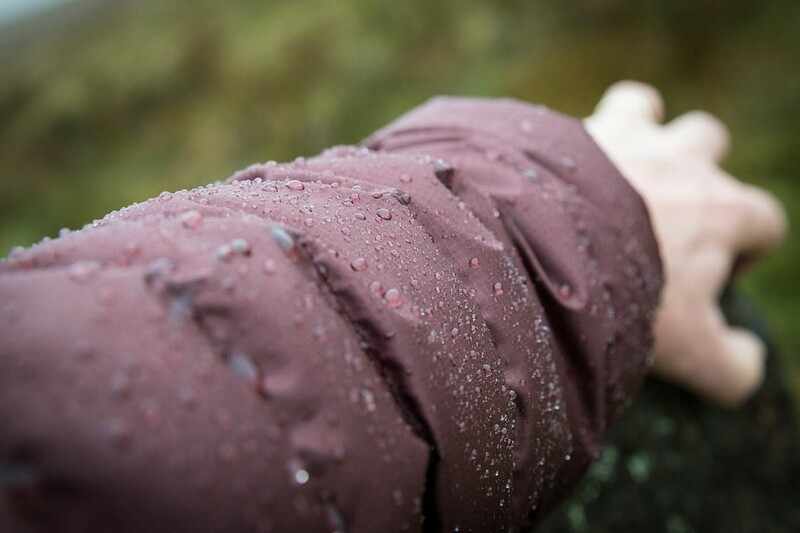 The unisex jacket has a very robust feel and is one of the heaviest in the test. Face fabric is Snugpak’s nylon Paratex Micro, with a grid ripstop pattern. Lining is nylon Paratex Light. The insulation is quilted in a diagonal pattern. The full-length zip is water-resistant and has a double puller. There’s no chin guard or cowl for the zip puller, and it felt quite cold in freezing conditions against the mouth. The hood is a roll-away design, secured into the collar by a Velcro fastener. There’s no insulation in the hood, just a soft tricot lining. Adjustment is via two spring toggles, but is quite fiddly. The hood is really there to keep showers off the head rather than provide warmth. The insulated collar can also be cinched in with a single spring toggle. The hood isn’t particularly comfortable but will keep wind and rain at bay. The hood will take a helmet and turned better while wearing one. The jacket hem is adjustable via twin spring toggles to cinch in and keep out draughts. Sleeve cuffs have double elasticated hems and a thumb loop, which kept the weather out well. The SJ6 has two zipped handwarmer pockets and an interior zipped chest pocket which will accommodate a laminated OS map. The two external pockets remained accessible while wearing a harness. The Snugpak jacket has a less soft feel than many of the ones in the test but is still comfortable if a little unyielding and bulky. Breathability was quite good for a jacket of its warmth. Materials feel durable, and the price, for a UK-produced garment, is very competitive. The Mylas is a lightweight down jacket from Sprayway, which uses PTFE-treated duck down to help water-repellency. The down is 700+ fill-power and is quilted using both horizontal and vertical baffles. The face fabric is ripstop polyester and lining is nylon. The full-length main zip has a single puller and is backed by a baffle to keep out draughts. The jacket’s hem has drawcord adjustment, with twin spring toggles allowing the front and rear sections to be cinched separately. The sleeve cuffs are elasticated. The hood is a simple but effective design, with no adjustment but an elasticated edging which hugs the face well. The hood stayed up in a headwind and was comfortable. It also accommodated a helmet, either worn under or over the helmet. There are two zipped handwarmer pockets and the Mylas also has an internal zipped mesh pocket, big enough for a smartphone. The outside pockets remained accessible while wearing a harness. The Sprayway jacket is comfortable with a soft-feeling face fabric and the insulation lofts well. It compresses well and comes with a stuffsack with drawcord closure and a hanging loop. The big attraction of the Mylas is its price. 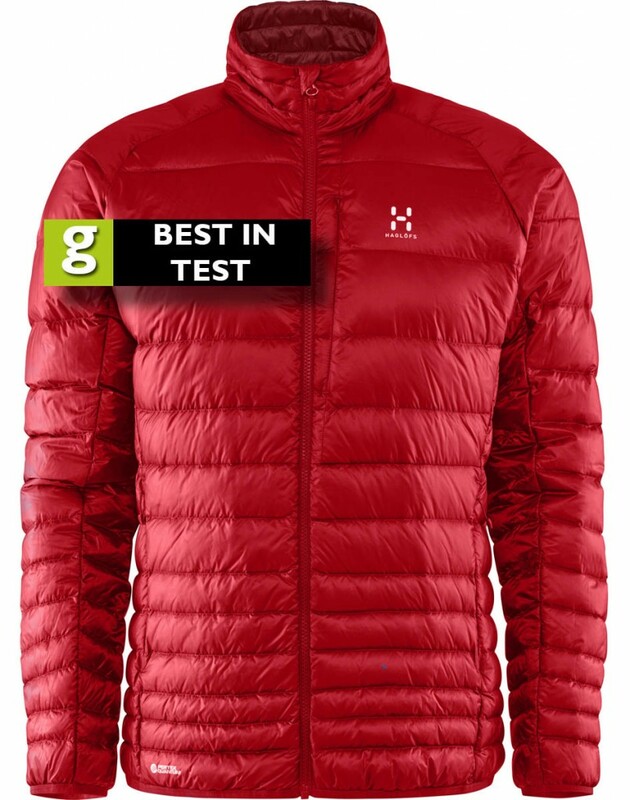 It’s the only jacket that uses water-resistant down in the test that sells for less than £150. It’s a basic hydrophobic down jacket that does the job at a very competitive price. The top scorers in our test were the Berghaus Extrem Nunat Reflect, which was warmest, and the Haglöfs Essens III Down Jacket, which was lightest and most packable, though it doesn’t have a hood which might be a factor for some buyers. Close behind was the Montane Blue Ice Jacket, which performed well but it too doesn’t have a hood. If the Gore Thermium jacket was a production garment, it would have been up there too, so keep an eye out for brands using this new material. The Keela smock and the Snugpak jacket are good bets for outdoor fans looking for warmth at a keen price, while the Rab and Fjällräven jackets are a good bet for anyone who wants a thinner jacket providing medium warmth. 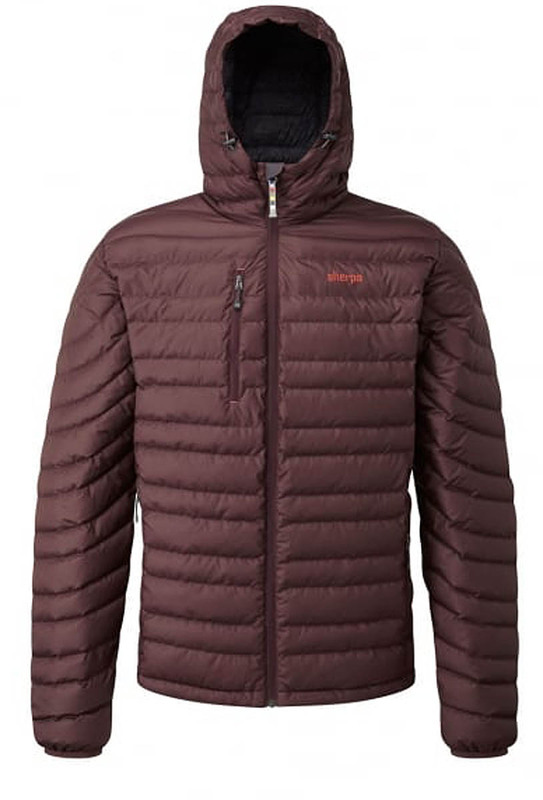 And for a no-frills down jacket, the Sprayway Mylas offers very good value. All the samples in grough’s test were provided by the brands.